A forward trying to score a goal. 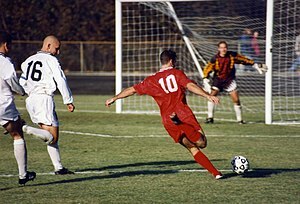 A Striker (or a forward) is a football player who is the closest to the other team's goal. The forwards are the players that are known to score the most goals. Coaches usually send a forward that scores all the goals (the centre forward) and sends another forward that makes the assists (second striker). This page was last changed on 10 November 2018, at 07:45.